Henrik and Daniel Sedin have each scored more than 1,000 points in their 17 seasons. VANCOUVER, British Columbia — Vancouver Canucks forwards Henrik and Daniel Sedin announced they will retire at the end of the season. The 37-year-old twins disclosed their plans Monday in a letter on the team’s website before addressing media later. The Sedins are in their 17th season, all with Vancouver. They led the Canucks to within one game of winning the 2011 Stanley Cup, but Vancouver lost to the Bruins in seven games. Henrik Sedin has 1,068 points (240 goals, 828 assists) in 1,327 regular-season games, while Daniel Sedin has 1,038 points (391 goals, 647 assists) in 1,303 games. Henrik won the Art Ross Trophy as the league’s top scorer in 2009-10 with 112 points. He also won the Hart Trophy as league MVP that year. Daniel won the Art Ross in 2010-11 with 104 points and received the Ted Lindsay Award as the league MVP voted on by the players. BRUINS: For the second time in a month, Brad Marchand is going to have to pay up to the NHL’s Department of Player Safety. The league announced that Marchand has been fined $5,000 – the maximum amount under the CBA – for cross-checking Flyers defenseman Andrew MacDonald during Sunday’s loss to Philadelphia. The play occurred with under a minute to go in the second period, after MacDonald knocked Marchand into the boards. As MacDonald fell down on the ice, Marchand spun around and delivered a cross check that hit MacDonald in the face/chin. Marchand was whistled for a cross-checking penalty. Marchand was fined $2,000 on March 9 for diving/embellishment. Back on Jan. 24, Marchand was suspended five games for elbowing Devils forward Marcus Johansson – leaving the New Jersey skater with a concussion that has caused him to miss the last 21/2 months of the season. WILD: All-Star defenseman Ryan Suter has a broken right ankle that will require surgery, putting his availability for the playoffs in doubt. BLUES: Forward Scottie Upshall is out indefinitely because of a lacerated left kidney. 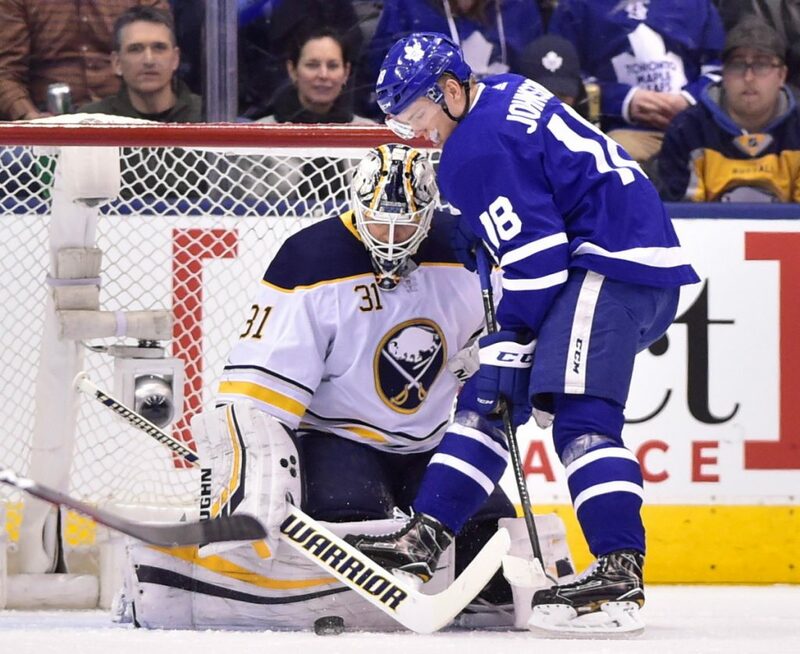 MAPLE LEAFS 5, SABRES 2: William Nylander and Auston Matthews each had two goals and an assist as Toronto won at home. Andreas Johnsson also scored as the Maple Leafs extended their franchise record with their 48th win and matched the team mark for points (103), set in 2003-04. Backup goalie Curtis McElhinney stopped 32 shots to help Toronto win for the 15th time in the last 17 at home. Matthews extended his point streak to seven games in Toronto’s 28th home win of the season. He has five goals and 10 points during his run. PANTHERS 3, HURRICANES 2: Defenseman Alexander Petrovic scored the go-ahead goal with 7:58 remaining, and Florida kept its shrinking playoff hopes alive with a win over visiting Carolina. MacKenzie Weegar scored his second goal of the season and Evgenii Dadonov got his 27th for the Panthers, who are five points behind New Jersey and six behind Philadelphia for the two wild-card spots in the Eastern Conference. Florida has four games remaining – one more than the Devils and Flyers.